The untold world of a salesman sure is funny. A group of real estate salesmen (Jack Lemmon, Al Pacino, Ed Harris and Alan Arkin) in Chicago vie for the best “leads” at a small firm selling property in resort areas such as Florida and Arizona. 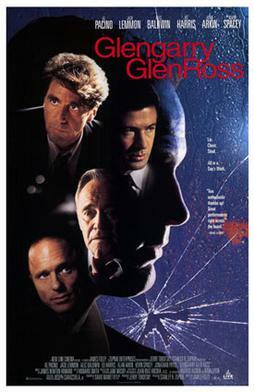 When a hot shot executive (Alec Baldwin) from the head office arrives and proposes a vicious sales contest (the winner gets a Cadillac, the loser gets fired), competition gets stiff, and the veteran salesmen suddenly find their jobs in jeopardy. The film is adapted from a play back in 1982 when times were good, now the times are tough and it creates a great piece for this story. This is surely a movie for people who love dialogue filled movies. The screenplay is the best I have ever heard in my life and it’ so funny but yet so true. These real estate salespersons are so broke they try their hardest to save their jobs and make a deal, but yet they still find ways to make hilarity when their in this time. Now the screenplay couldn’t have been too great without the actors delivering them. The ensemble cast does an amazing job in this film its really hard to say who does the best, since they are all so equal. Lemmon you fell bad for, Pacino is the funny guy at the office who doesn’t take crap, Ed Harris and Alan Arkin are the two buddies who always discuss real estate, and Kevin Spacey plays the boss who is a square and gets made fun of a lot. Alec Baldwin also has an amazing scene where he is just so nasty that it’s really funny. Though the story was well-acted and had a very witty and well-written screenplay the story itself didn’t really grasp me. I felt myself bored at points, and I thought that the movie didn’t do much to keep the story interesting. Consensus: Great script and a well-acted ensemble, features a great dialogue filled movie that shows the real life of desperate salesman’s.